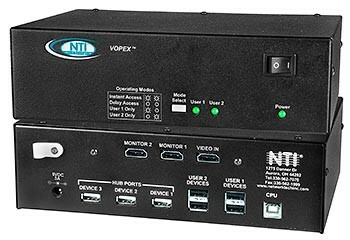 The VOPEX® DVI/HDMI USB KVM splitter with built-in USB hub and optional audio allows up to four users (four USB keyboards, USB mice and DVI/HDMI monitors) to access one USB computer and up to three USB devices (printers, scanners, security cameras, etc.). Also known as: HDMI DVI USB splitter with built-in USB hub, keyboard monitor mouse splitter, reverse KVM switch, four users control one USB PC SUN MAC computer. 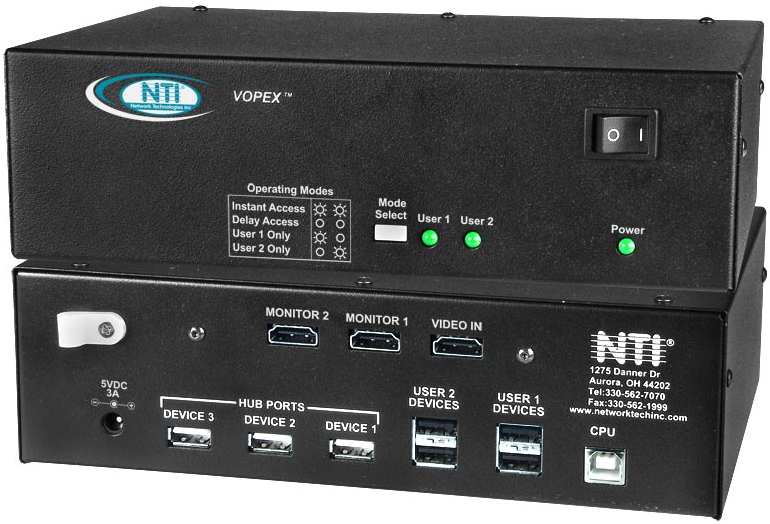 The VOPEX ® DVI/HDMI USB KVM splitter with built-in USB hub allows up to four users (four USB keyboards, USB mice and DVI/HDMI monitors) to access one USB computer and up to three USB devices (printers, scanners, security cameras, etc.). Supports a USB computer (PC, SUN, MAC) with DVI/HDMI video. Compatible with most USB keyboards and mice, including Microsoft USB Intellimouse®, Logitech Cordless Elite Duo keyboard and mouse, Gyration keyboard/mouse and Crystal Vision keyboard with touchpad. Does not support USB touchscreen monitors. Use the included three-foot DVI-D male to HDMI-A male single link cable to connect a DVI-D source or display. One-meter male USB Type A to male USB Type B cable included. Press Mode button to cycle through all four modes. LEDs indicate which mode is selected. User 1 Mode - Only User 1 can type or move the mouse. User 2 Mode - Only User 2 can type or move the mouse. User 3 Mode - Only User 3 can type or move the mouse. User 4 Mode - Only User 4 can type or move the mouse. Inst Mode - Keyboard or mouse activates immediately. Delay Mode - Locked out user must wait five seconds after last keystroke or mouse movement occurs on active user. "The VOPEX-USBH-2 KVM Splitters are working great. We have not had any problems at all. We are purchasing an additional one as a spare."